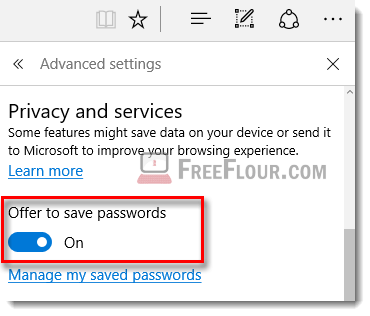 Simple guide on how to turn off or on, disable, never remember, remove or managed saved passwords in Microsoft Edge browser in Windows 10. This post is to show you everything about remember passwords in Microsoft Edge, the new internet browser meant to replace Internet Explorer in Windows 10, how you can get Microsoft Edge to remember passwords, how to turn off, disable or set the feature to never remember passwords, view and managed your saved passwords in Microsoft Edge. When you visit a website that requires you to log in or sign in to an account which usually involves entering your username and password, Microsoft Edge will ask you if you want to save and remember the passwords you have just entered so that the next time you visit the same website you no longer have to repeat and enter the username and password again. If Microsoft Edge remembers your passwords, the next time you enter your username, the password will be auto filled. Since Microsoft Edge is an entirely different browser from Internet Explorer, every setting that we have gotten used to previously in Internet Explorer are now mostly at a different location. By default after installing a fresh Windows 10 and assuming there isn’t anything (including your antivirus software) that has the ability to configure your browser setting, Microsoft Edge will always send you a pop up asking if you want it to remember your passwords whenever you visit a new website that requires a sign in. If it doesn’t show up at all and you want Microsoft Edge to remember your passwords, open up Edge. Click on the more settings icon (…), then Settings. Scroll down to the very bottom and click on Advanced Settings. Look for the Offer to save passwords option and turn it On. Try to login to a new website again. It should now ask you if you want Edge to remember and save your passwords. To turn the remember saved passwords feature Off, go to the same option setting. Settings, Advanced Settings, then Offer to save passwords. 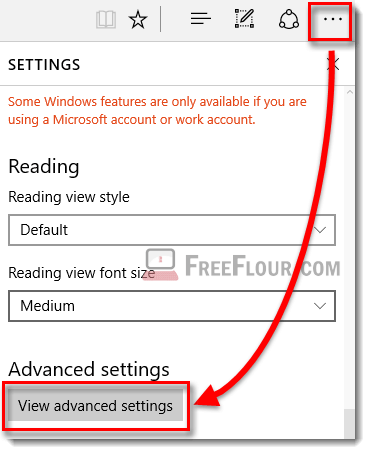 Simply swipe the On to Off to disable the remember passwords feature in Microsoft Edge and it will never remember your passwords ever again if the option remains disabled. 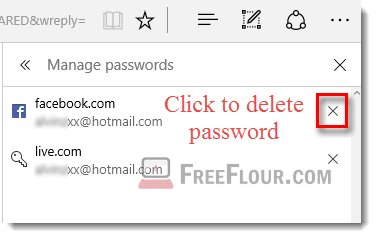 If you want to remove certain previously saved passwords, or if you simply want to view what passwords has been saved in Microsoft Edge, follow the below instruction. Click on the more settings (…) icon. Click on Settings, then Advanced Settings. Right under the Offer to save passwords option, click on the manage my saved passwords link. From there, you can manage all your previously saved passwords since you started using Microsoft Edge, and remove whichever password you feel unnecessary. Tips: you can also click on the pin this pane icon at the upper right corner of the panel to prevent the option panel to disappear when you switch window or close Microsoft Edge. Letting Microsoft Edge to remember your passwords can be both advantageous and disadvantageous. The good side being of course to be able to quickly login to whatever account on whatever website without having to always recall your passwords over and over again. The bad side, however, is that if anybody get to use your computer, or if you set to remember passwords on a public computer where everyone else can access, you will definitely risk getting your account stolen since people who can use the same computer will have your saved password and can do whatever they want with whatever account you have.